I'm just catching up with the news that French author Roger Grenier has passed away; see for example the Libération piece. The University of Chicago Press brought out several of his works over the past years, and two of these are under review at the complete review -- Another November and Palace of Books -- and, yes, he rated a mention in my The Complete Review Guide to Contemporary World Fiction. The most recent addition to the complete review is my review of Jon Fosse's Boathouse. They've announced that the 2017 DSC Prize for South Asian Literature goes to The Story of a Brief Marriage, by Anuk Arudpragasam. I haven't seen this, but it's both US and UK available; see the Flatiron and Granta publicty pages, or get your copy at Amazon.com or Amazon.co.uk. In the Myanmar Times Zon Pann Pwint reports on U Myo Thant and U Thaw Kaung's just-published Biographical Dictionary of Twentieth Century Myanmar Writers, covering 137 authors; see also the publisher (Myanmar Book Centre) publicity page. Meanwhile, at Mizzima Ben Dunant reports on the recent Irrawaddy Literary Festival, in Culture shock: Irrawaddy Literary Festival -- while in the South China Morning Post Kate Whitehead reports that Future of Myanmar's Irrawaddy Literary Festival thrown into doubt after accusations of poor organisation. The most recent addition to the complete review is my review of Bolivian (but living in the US ...) author Rodrigo Hasbún's widely-hailed Affections, which came out in the UK last year (from Pushkin Press) and has now also arrived in the US (from Simon & Schuster). They've announced another 'guest of honour' at the Frankfurt Book Fair: in 2021 Spain takes center stage, for the first time in 30 years (though Catalan literature slipped in there in the meantime ...). And it looks like Slovenia is the 2022 frontrunner -- no official announcement/agreement yet, but they obviously think they're on the verge. The Prize of the Leipzig Book Fair -- the spring German best book prize, sort of the younger/smaller sibling of the German Book Prize -- will only announce its longlists on 8 February, but they've now finished the submission period, and report that they have 403 titles to consider, in the three categories in which they award prizes. Disappointingly (and inexplicably) they don't actually name/list the titles ...; indeed, they don't even offer a breakdown by prize-category. The prize is noteworthy for not only honoring a best work of fiction (like the German Book Prize) but for also honoring non-fiction, as well as best translation . The Guardian has Anita Desai on her literary apprenticeship with Ruth Prawer Jhabvala -- complete with V.S.Naipaul anecdote. It seems doubtful the prize-win will do much to raise his US/UK profile -- despite his interesting backstory (which includes a five-year stint as vice-president of Nicaragua); it hasn't done much (at least not that I've noticed) for the last three winners -- Eduardo Mendoza (No Word From Gurb, etc. ), Fernando del Paso (Palinuro of Mexico, etc. ), and Juan Goytisolo. They've announced the 2018 (American) National Endowment for the Arts fellowships for creative writing (prose) (36 x US$25,000) and for literary translation (22 x $12,500/25,000). The list (warning ! dreaded pdf format !) of the creative writing recipients only offers their names (and headshots ...), but the list (warning ! dreaded pdf format !) of translation recipients includes descriptions of their projects -- a nice variety that includes a couple of Indian-language translations -- novels by Intizar Husain and U.R.Ananthamurthy, for example --, an Angélica Gorodischer novel, and a novel by an author: "Known as the cult author of Bolivian supernatural gothic literature" (Giovanna Rivero). Great to see the translation- and writing-support -- especially given the current administration's antipathy towards the NEA and its mission. The most recent addition to the complete review is my review of the latest volume in NYU Press' Library of Arabic Literature-series, Ḥmēdān al-Shwēʿir's Arabian Satire: Poetry from 18th-Century Najd. They've announced that H(a)ppy, by Nicola Barker, has won this year's Goldsmiths Prize -- a �10,000 prize that: "is committed to rewarding British and Irish fiction that breaks the mould or extends the possibilities of the novel form". They've announced the winners of the 2017 (American) National Book Awards in the four categries they have. The fiction prize went to Sing, Unburied, Sing, by Jesmyn Ward; see the Scribner publicity page, or get your copy at Amazon.com or Amazon.co.uk. The non-fiction prize went to The Future Is History: How Totalitarianism Reclaimed Russia, by Masha Gessen; see the Granta publicity page, or get your copy at Amazon.com or Amazon.co.uk. The Warwick Prize for Women in Translation is a new prize for: "the best eligible work of fiction, poetry or literary non-fiction, or work of fiction for children or young adults that has been written by a woman, translated into English by a female or male translator, and published by a UK or Irish publisher", and they've announced (though not yet at the official site, as I write this ...) that Memoirs of a Polar Bear, by Yoko Tawada, and translated by Susan Bernofsky, has won the inaugural prize. Hey, a book I've reviewed ! The most recent addition to the complete review is my review of Ogawa Yoko's ことり -- the seventh Ogawa under review at the complete review (and the third not (yet) available in English ...). The French and Germans are much better at keeping up with her output, but at least another Ogawa is due in English next year -- not this one, but The Memory Police; see the Curtis Brown information page -- and you can even pre-order the (UK) edition at Amazon.co.uk. At Deutsche Welle Kürsat Akyol reports that Books come under suspicion in post-coup Turkey, as: 'since Turkey's attempted 2016 coup, a growing number of books have been outlawed and confiscated, with some even being considered evidence for certain crimes'. The news here, however, isn't who won, but rather that that iconic address -- Quai des Orfèvres, police headquarters for Maigret and everyone else -- is no longer the Parisian HQ. Maybe they need to rename the prize '36 rue du Bastion' -- the location of the new headquarters. Not quite the same, is it ? The most recent addition to the complete review is my review of Andrée A. Michaud's prize-winning novel, Boundary: The Last Summer, now out in English from No Exit (in the UK) and Biblioasis (Canada/US). The Swiss Book Prize -- which is, in fact, only the German-language Swiss Book Prize -- has been awarded to Kraft, by Jonas Lüscher (which was also longlisted for this year's German Book Prize); see also the New Books in German review (and information), and the C.H.Beck information page. Despite (but also in part because of ...) the Silicon Valley locale connection, this looks to me like the likeliest to land in the US/UK of the three German-language national book award winners. Haus did bring out Lüscher's Barbarian Spring not too long ago; despite some decent attention (very favorable reviews in The New York Times Book Review and Wall Street Journal !) it does not seem to have made much of an impression; see also the US distributor's publicity page, or get your copy at Amazon.com or Amazon.co.uk. Obviously, there was a ... shortfall in the marketing of this title: the New York Public Library has a non-circulating copy of the German original, seven (!) circulating copies of the French translation (really ! what the hell is that about ?) -- and not a single copy of the English version; FWIW, I didn't get a copy either. If you think French literary prize juries are more discerning than American ones, then maybe you want them to decide what's best in American fiction, too; if so the just-announced Grand prix de littérature américaine is for you -- and, hey, that's certainly a more impressive prize-title than 'Pulitzer' or 'National Book Award', isn't it ? Anyway, this year's prize goes to Everybody's Fool, by Richard Russo; see the Livres Hebdo report, as well as the Vintage publicity page, or get your copy at Amazon.com or Amazon.co.uk. The most recent addition to the complete review is my review of Tomas Espedal's Bergeners, the latest Espedal out from Seagull Books. 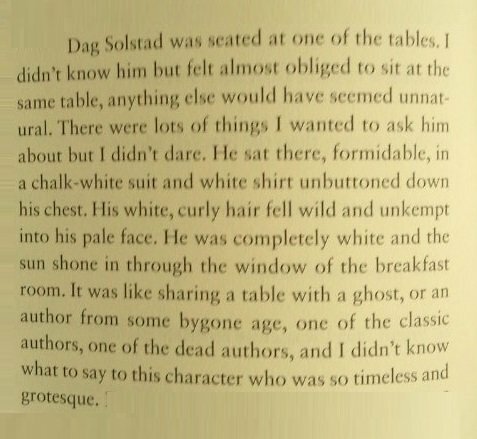 Espedal is great; Solstad is ... oh, just read him. There must still be copies of Shyness and Dignity out there (and, for the patient, New Directions have a couple coming up in the years to come ...). It took a while -- and two publishers, C.H.Beck bowing out after giving it a try with the first volume, before Verbrecher Verlag picked it up and published the full seven-volume series -- but J.J.Voskuil's Het bureau, all ca. 5500 pages worth, first published in Dutch between 1996 and 2000, is now available in German translation; see, for example, the publicity pages for volume one at G.A. van Oorschot and Verbrecher Verlag, as well as now this (German) Q & A with Verbrecher Verlag-publisher Jörg Sundermeier at BuchMarkt about the undertaking. This office-novel is something of a modern cult novel/epic in the Netherlands -- but poses obvious translation issues (mainly its bulk, and the cost of translating that, but also the question of whether this kind of thing might have any appeal abroad; five volumes in, the taz reviewer argued it won't fly in a Germany where the middle class looks towards escapist fiction, not writing that realistically mirrors daily life -- and thinks Melville's Bartleby, the Scrivener is the most obvious book to compare it to (though Melville's novella doesn't go on for over 5000 pages...)). See also the Dutch Foundation for Literature's J.J.Voskuil-information page. The most recent addition to the complete review is my review of Svetislav Basara's In Search of the Grail: The Cyclist Conspiracy, Part Two. The first part, The Cyclist Conspiracy, came out from Open Letter a few years ago, but it's Dalkey Archive Press that have brought out this 1990 novel; good also to see that they're continuing to bring out more of this prolific author's work: the story-collection Fata Morgana two years ago (see their publicity page, or get your copy at Amazon.com or Amazon.co.uk) and, next year, the promising-looking Mongolian Travel Guide (see their publicity page, or pre-order your copy at Amazon.com or Amazon.co.uk). I mentioned in my The Complete Review Guide to Contemporary World Fiction that: "One very popular Chinese literary genre that has received limited attention abroad is wuxia, martial arts fiction. ", and the only example I cited was the phenomenally popular Louis Cha ("superior historical entertainment and a welcome escapist alternative", I suggested), as Oxford University Press has actually brought out some (expensive) editions of his work, including The Deer & the Cauldron (in a John Minford translation ! it's the only one which I actually own); see their publicity page, or get your copy at Amazon.com or Amazon.co.uk. Jin Yong enjoys massive popularity among the Chinese readers. However, the Western world has barely heard of his name, partly because of the limited power of translations to accurately transform emotion and essence of traditional Chinese culture and literature into English. Well, let's hope Anna Holmwood manages. (Updated - 18 November): See now also Echo Huang and Isabella Steger's report at Quartzy, The Lord of the Rings of Chinese literature is finally being translated into English. The most recent addition to the complete review is my review of Tom Gauld's new comics-collection, Baking With Kafka. German publisher Reclam's 'Universal-Bibliothek' is one of the great classic-literature series (which also includes some modern texts), published (for the most part) in the ubiquitous small yellow volumes (though there are also other colors, and designs, including: red for foreign language texts -- they do that too (e.g. Amélie Nothomb's Antéchrista) -- and orange for the bilingual editions, and a lot of my ancient ones are still the old pre-yellow off-white) and in the perfect true pocket-size -- and they're now celebrating their 150th anniversary; see Sabine Peschel's Reclam Publishers' yellow little books: 150 years of world literature at Deutsche Welle. These days, there are some 3,500 titles available in the Universal-Bibliothek, with total sales of 0.6 billion copies. The most recent addition to the complete review is my review of Geoff Nicholson's new novel, The Miranda. This is the nineteenth Nicholson-title under review at the complete review: only Naguib Mahfouz and Amélie Nothomb have more titles under review; he definitely seems underappreciated to me.